Here’s what I’m working on today. I’m not able to keep this in tune. My C is too flat. 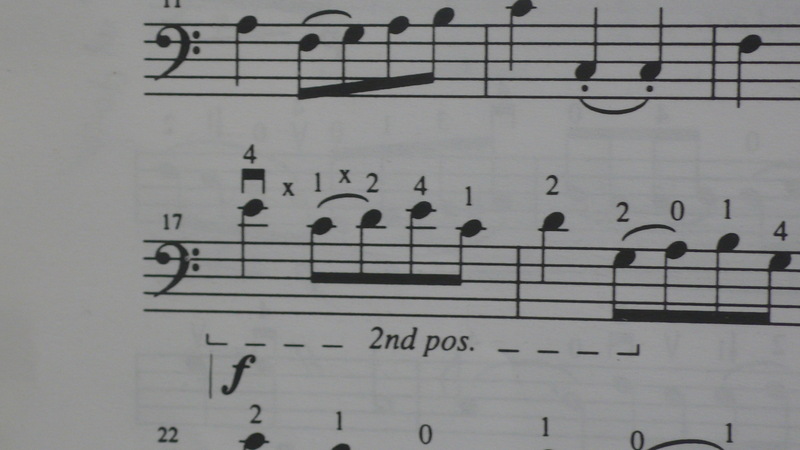 I also need to come back to D in tune, since this is basically a turn on D, and that has to be a good reference point. First, my goal is to get the E in my head, and really hear the major third E-C. Then, to stay in tune, I’d like to have my thumb be my point of orientation while I adjust my arm structure and relax my 1 finger in order to get C. Then, my thumb can help me find D again. I still haven’t gotten it; in fact this post is coming at the beginning of the practice. As I find the right posture for my arm, I need to avoid tensing up the L shoulder. I am just curious about whether this is the approach recommended by Emily in her (should be) famous post. E – D – C# – D – E. Hand in closed position. Observe how the balance over each playing finger changes, and the postion of the thumb. Go back and forth between those two patterns a number of times, then try your passage. Report the result of your experiment. I did do the point at my ear thing, but that puts me closer to B than to C. I do say that I’m not gripping much – that’s never been a serious issue for me. But when I place it, even loosely, it seems to be problematic for me. Just read your other post feeling that I should have posted earlier — might’ve saved you some time. Thumb always has to be relaxed and NOT gripping the neck so that it can move freely. Your shifts and extensions will be easier and faster and more accurate that way. GGP’s exercise is an absolutely fantastic idea. For me that C-D-E on the A string has been the most difficult extension of them all — it was the reason my teacher took me into her teacher because I was having so much trouble. That being said, your thumb should move further down (pitch-wise) when you extend for the C and then back up (pitch-wise) when you go for the D. If you don’t keep thumb relaxed so it can move, your C will always be sharp and D always flat. And your thumb will hurt. And make your other thumb more tense and your bowing will suffer. At least that’s what my teacher’s teacher told me to do, and it worked beautifully. Keeping thumb in the same spot just was a guarantee for failure for me. But, start out with making sure your bow thumb is extremely relaxed also. We discovered at my lesson with my teacher’s teacher that my left thumb was tensing because my right thumb was tensing. We spent weeks working on this same issue to no avail until her teacher pointed out that my right thumb was where the tension started (“Playing cello is like a math equation.” -my teacher.) As soon as I could keep right thumb totally relaxed, left thumb naturally relaxed and I was able to use it for help extending. Okay, bit more than I was expecting to write. Hope it made sense and was helpful. Good luck! A lot of what you wrote, particularly the right-left connection issue, squares with what I’ve heard before. So it’s definitely credible. It was helpful to hear it again, though. I’ve since given up on the thumb being still idea; that was clearly a bad idea. I’ve since letting it move loosely down (pitch-wise) as you had described. Now that I feel more confident of the motion, I’m doing the exercises at a glacial pace and will pick up the pace gradually. It’s like the refigrerator that is never broken when the repair technician comes. If you say you’re having an issue at home with it, he should be going over your technique with you. It’s still possible to get good intonation with bad technique, but it’s better to fix it. My teacher spends a lot of time going over stuff that I do perfectly well and I always learn a ton. And your thoughts about Feuillard that you expressed to Les were quite interesting. That sentiment you have about Suzuki is shared by my teacher. That’s why I’m also working through Kummer as well as some supplementary work from Dotzauer. The one advantage to Suzuki is that we all seem to have copies of the book, so I can quote a measure in the blog, and everybody can look it up. But overall, I do agree with you. Well, I’m working in Feuillard and Eveningprose also worked out of it. So there are two of us who would know. When I wanted to post something about a specific piece I took a picture of it and posted that so people could see it. Also, when someone has a post about problems on a specific part and I give advice, I never really look at the piece itself. Usually people say “I’m having trouble with this extension” or “I’m having trouble with this shift” or whatever. The advice people usually need in that case has nothing to do with the specific part they are having trouble with. Rather, the measure or phrase or whatever is pointing out a flaw that is inherent in the person’s technique and which needs to be looked at in broader terms. My teacher also has me working out of the Schroeder etude book at the same time, but that’s more something I do myself on my own schedule. It has etudes by Lee, Dotzauer, Schroeder, and others I don’t remember. For me that’s just irrelevant though. I just feel so strongly that Suzuki isn’t appropriate for adults and feel I would have grown disenchanted with the cello had my teacher kept me learning from them.